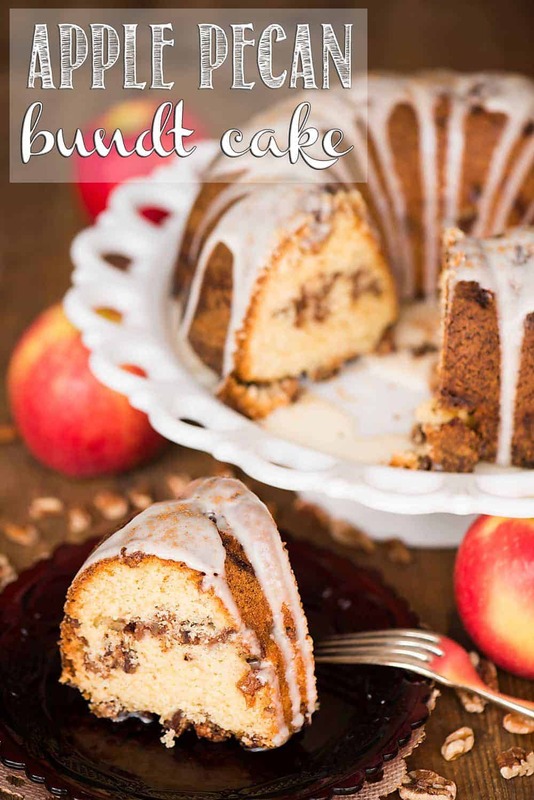 Apple Pecan Bundt Cake is an easy, made from scratch moist cake recipe full of your favorite fall flavors. It is perfect to enjoy for breakfast or dessert! 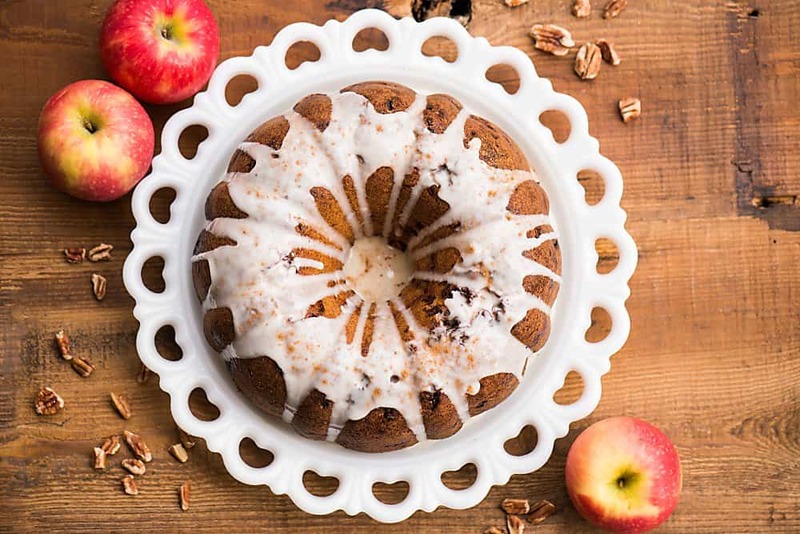 Apple Pecan Bundt Cake is one of those sweet treats that make everyone happy this time of year. Fall recipes are all about using fresh apples, pears, and pumpkins. Sweet desserts and breakfasts fill your home with the wonderful aroma of cinnamon, nutmeg, and everything that’s right. The days get shorter and cooler, the leaves change from green to all shades of yellow, orange, and red, and kitchens everywhere start baking again! Whether you love to enjoy treats like this after an amazing fall dinner or with your morning coffee, it is sure to please any apple lover. 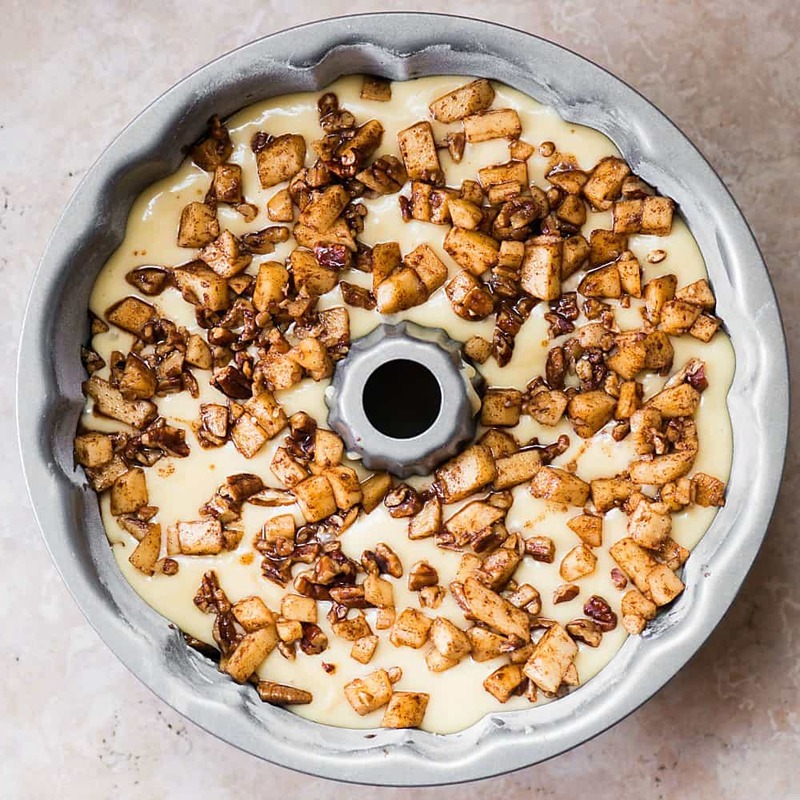 Now, I will admit, this recipe calls for a lot of pecans. I happen to love lots of nuts in my recipe, but my nephew said there were too many nuts. To that, I replied “you’re nuts”. Get it? We love stupid puns in our house. 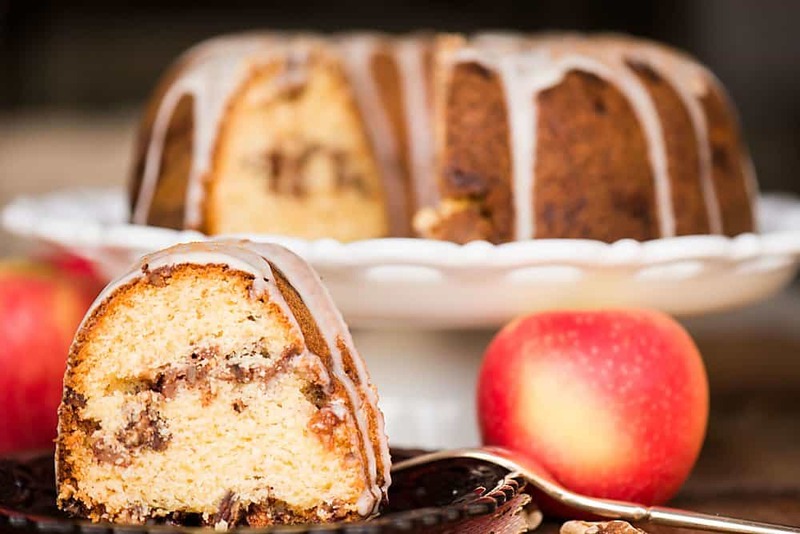 This particular bundt cake is layered with tons of cinnamon and spice covered apples and pecans. 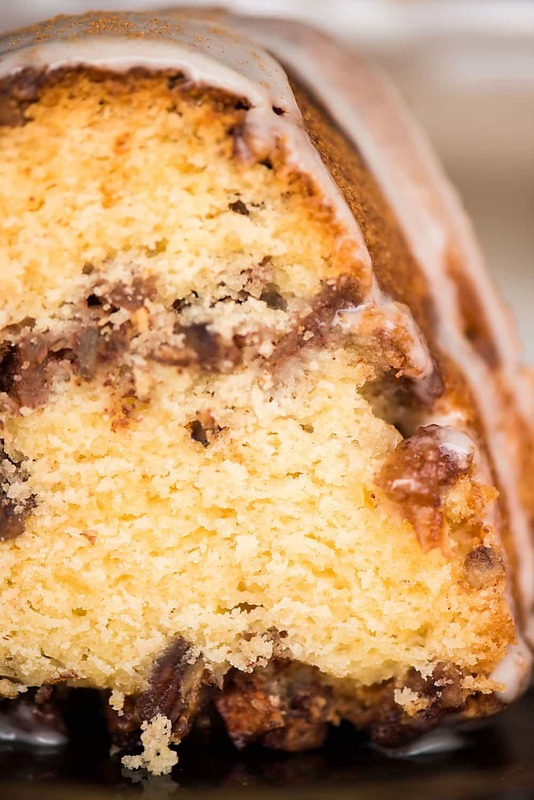 You could always mix them into the batter, but I’m a fan of seeing layers in my bundt cake. 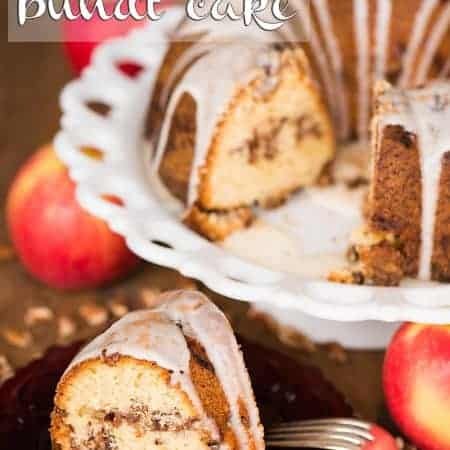 I did the same kind of thing when I made a pumpkin chocolate chip bundt cake, and there’s just something fun about trying to get equal parts of all ingredients on your fork. Are you one of those people who do that? I am. Why must a glaze on a bundt cake be so mesmerizing. My OCD always comes into play when I try to get the drizzle equally dispersed along the inside and outside walls of the cake. 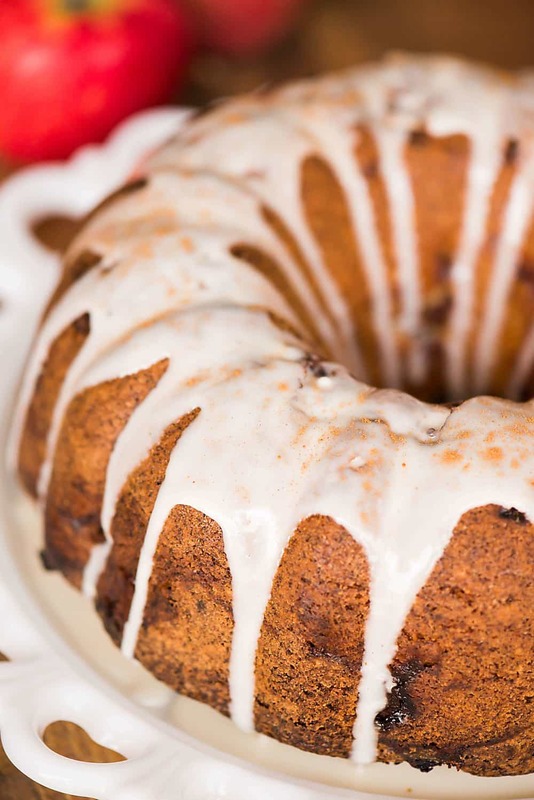 You’re just begging me to slice into this bundt cake right about now, aren’t you? I have to admit it was quite challenging to take a series of photos before getting to shove a huge bite into my mouth. Will power isn’t one of my strong traits. Here you have it. 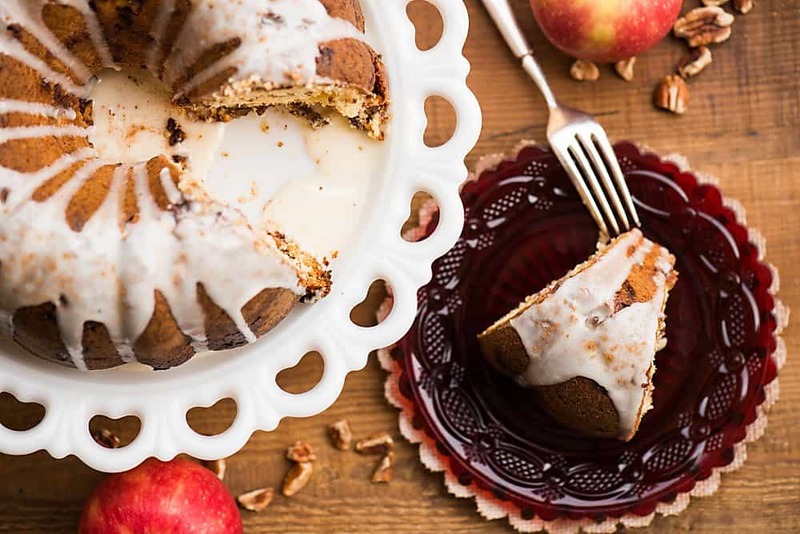 One perfect slice of Apple Pecan Bundt Cake with layers of baked fresh apples and spiced pecans, just begging for you to dig in. Now, I must know: would this be your dessert or your breakfast? I’m willing to bet most of my readers will say BOTH because you’re my kinda people! If making a cake from scratch, combine all of the dry ingredients including the sugars and then combine all of the wet ingredients separately. Then, add about half of the wet ingredients and really whip the batter well. Finish by combining the rest of the wet ingredients just until the cake batter is mixed. If using butter in your recipe, you’ll want to combine it with your dry ingredients first. Mix the butter and dry ingredients until the dry ingredients are coated in the butter and it holds together when you squeeze it. I learned this trick from my friend who is a cake maker extraordinaire! Be sure to always grease and flour your pans as indicated in the recipe. Nothing worse than having a cake not release from a pan. Ensure your oven is at temperature before you put your cake in the oven. Make sure it’s in the center too! Do not open the oven to check on the cake until you think you’re within just a few minutes of it being out. When you open the door, you let a lot of the heat out and that can really have an impact on your final product! Don’t take it out to early! I’ve ruined many cakes thinking they were done only to have them sink once they cooled. As much as I hate to over cook cakes, I’d rather have them turn out a wee bit overcooked and dry versus underdone and sunken in the middle. As soon as the pan is cool enough to touch without burning your skin, release the cake from the pan. If you leave it in there too long, it will start to sweat and release moisture, thus drying out the cake. Knives: There is nothing more frustrating than having to use a poor quality knife. I’ve been using this set for years. I found it to be affordable yet incredibly durable and versatile. Whether you’re filleting a salmon or slicing a super ripe tomato, these are great knives for the every day chef. 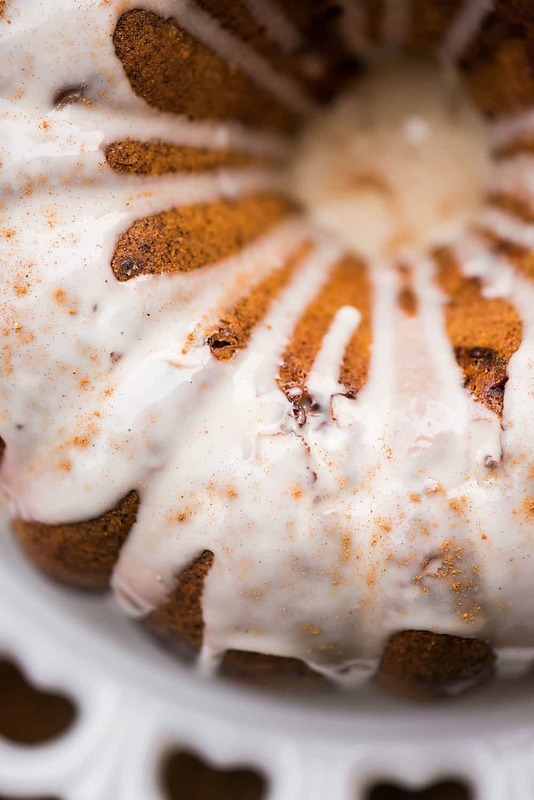 Bundt Pan: Tried and true, this is a kitchen must have. Preheat oven to 350 degrees F. Grease and lightly flour a 10’ bundt pan. Peel, core and chop apples into chunks. Toss with pecans, cinnamon, and ¼ cup of the sugar and set aside. Stir together flour, remaining sugar, baking powder and salt in a large mixing bowl. In a separate bowl, whisk together oil, orange juice, eggs and vanilla. Mix half to two thirds of the wet ingredients into the dry ones and mix on high speed until well combined and light and fluffy. Add remaining liquid mixture and mix just until all ingredients are incorporated. Add about a third of the apples to the bottom of the bundt pan. Pour half of batter into prepared pan over the apples. Spoon half of the remaining apples onto the batter. Pour the remaining batter over the apples and arrange the remaining apples on top. Bake for about 1½ hours, or until a tester comes out clean. Cool in pan on rack 15 minutes, then invert onto rack to cool completely in the pan, about 1 hour, and then transfer onto a plate. While the cake cools, add all the glaze ingredients to a small bowl and whisk together until smooth. Drizzle glaze over the top of cake, slice, add ice cream or whipped cream, and serve.